There are no growth spurts with this lizard. He is certainly growing, but at a slow and steady rate. If I can keep this pace of about ten centimeters a week, I will be able to finish this tapestry before we move from the apartment—our temporary residence. The timeline is set. Will this slow-going, slow-growing lizard cross the finish line before I must dismantle the loom again? Time will tell. 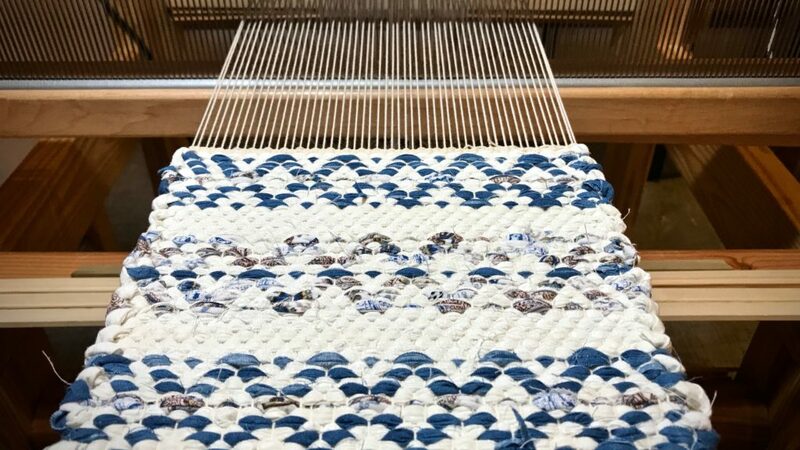 I have woven fifty centimeters. I have seventy-five centimeters to go. 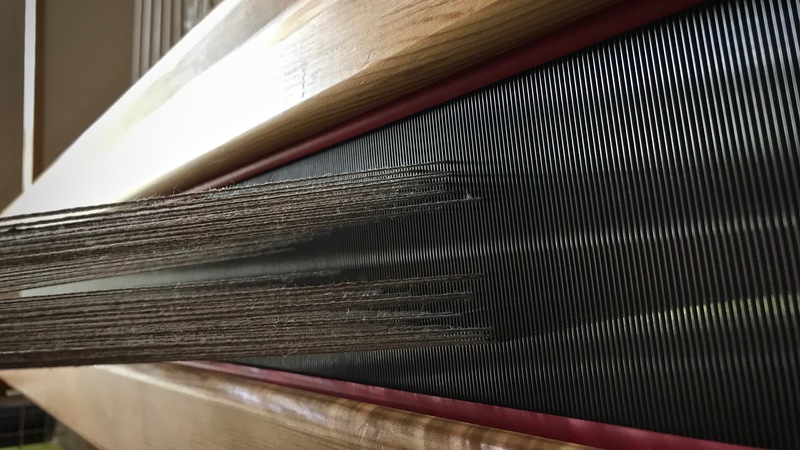 Lizard’s foot and leg are starting to disappear around the breast beam on the right-hand side of the loom. Head of the lizard is visible on the cartoon under the warp. Many wool butterflies crowd each other, due to frequent color changes in the details. Lizard is visibly growing. Currently working on the red mouth and blue eye. Grow. We are woven together by loving each other. 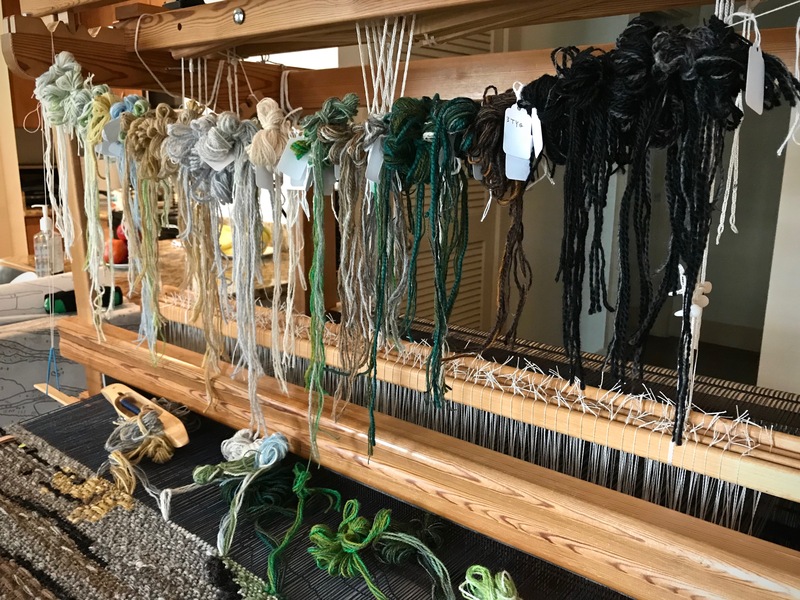 Each of us, like strands of wool yarn, with our own degree of hue, saturation, and value, not to mention twist and plies, are united with each other when we hold fast to Jesus Christ, the designer and weaver. His tapestry grows, not in spurts, but slow and steady, year after year, century after century. Always teaching us to love his way—sacrificially. 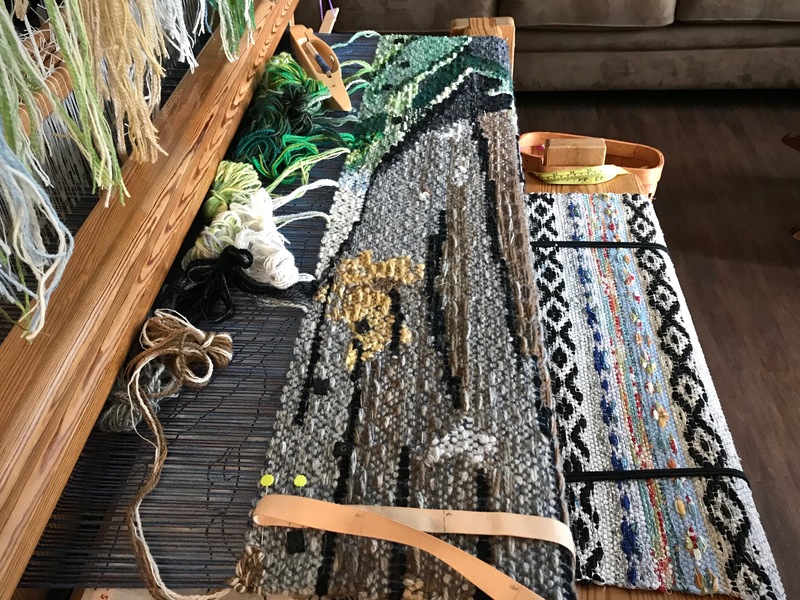 And we know he has just enough time to finish the tapestry masterpiece that he has envisioned from the very beginning. May you see slow and steady progress in things that matter. I love how you ‘weave in’ truths from God’s word and His love into your posts. 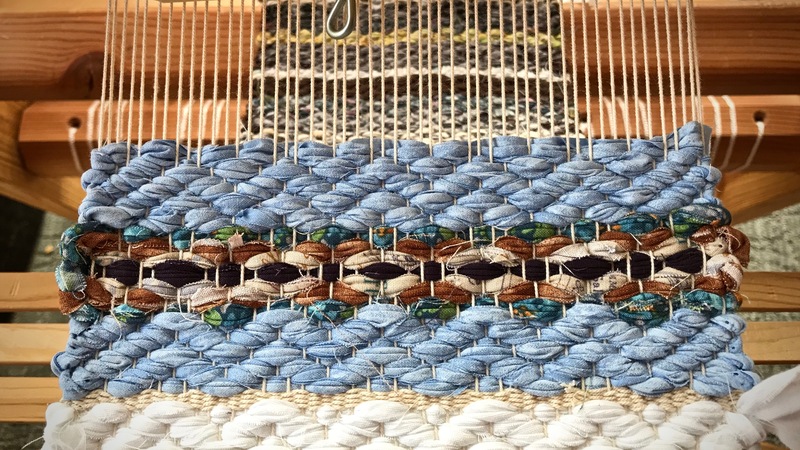 AND….you weaving is amazing! 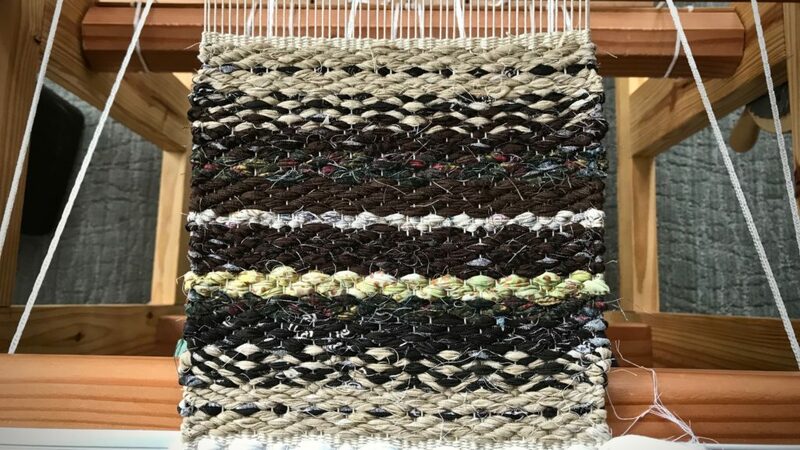 I have been weaving a short time and would love to have more time to devote to this delightful craft! Also knit, do paper crafts & sew. And I help care for aging parents and delightful grand boys. Never enough time to do all I would like – I guess I will have to wait till the kingdom :-). So much joy!!! 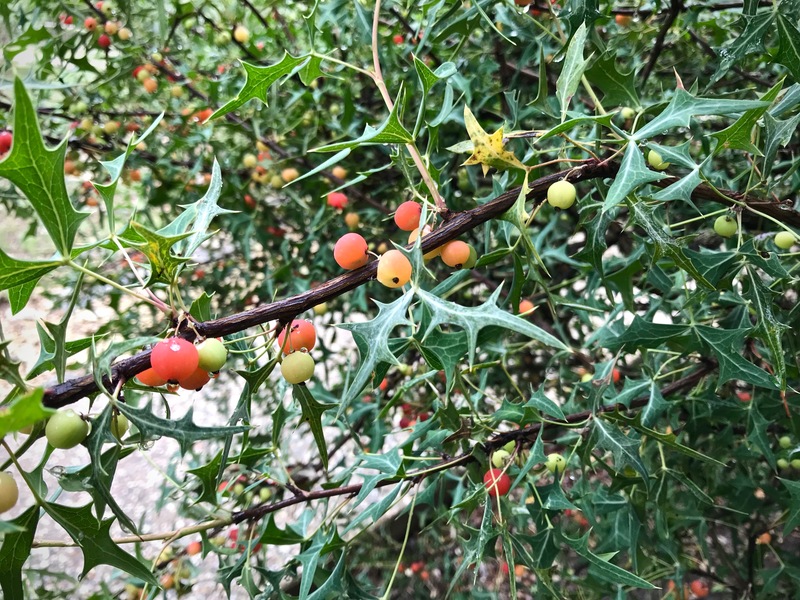 Hi Liz, You are in a very active season right now! It’s good you are enjoying what’s in front of you. 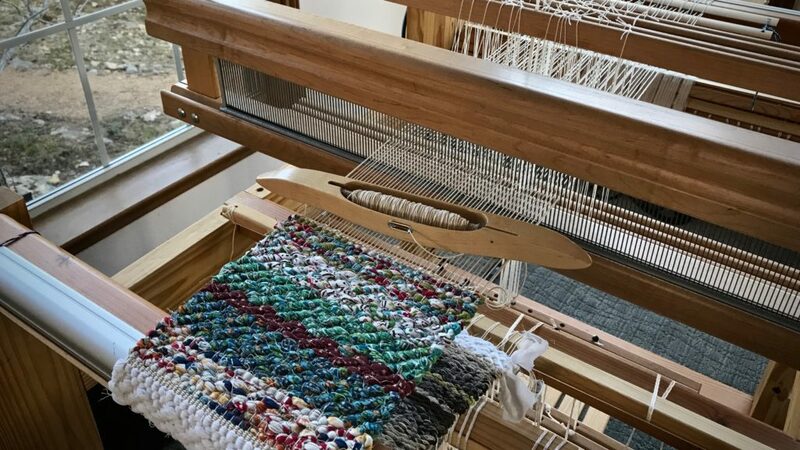 Weaving is my favorite creative activity, so I go to the loom as often as I can. I saw your post while waiting for the storms to pass over before heading north for a few days of exciting kitchen garden work. On the up side.. Local food pantries will accept an excess of fresh produce from home gardens. The trial garden my son put in is very successful and many will share God’s abundance this growing season. On the down side… it has been a few months since picking up a shuttle and I suspect it is accumulating dust. The detail of the lizard tapestry requires thoughts to focus on nothing but what you are doing. Not the temporary housing. Not the tying up of one life to transfer to another. Not when to contact the movers, or how are the grand babies doing. Just….. where would God put this color? Just saying that makes me calm down, and it is not my project. Let’s all enjoy the moment. Hi Nannette, That’s great advice – Enjoy the moment! The tapestry is now at forty centimeters, and the lizard is slowly crawling his way around the breast beam. I treat every ten centimeters as a milestone. It’s a good time to examine the work and make additional butterflies. I see that I need forty-four new butterflies to make it through the next ten centimeters! No two butterflies are identical. I vary the combination of yarns for each color set. These subtle color and textural variations add interest and depth to the piece. 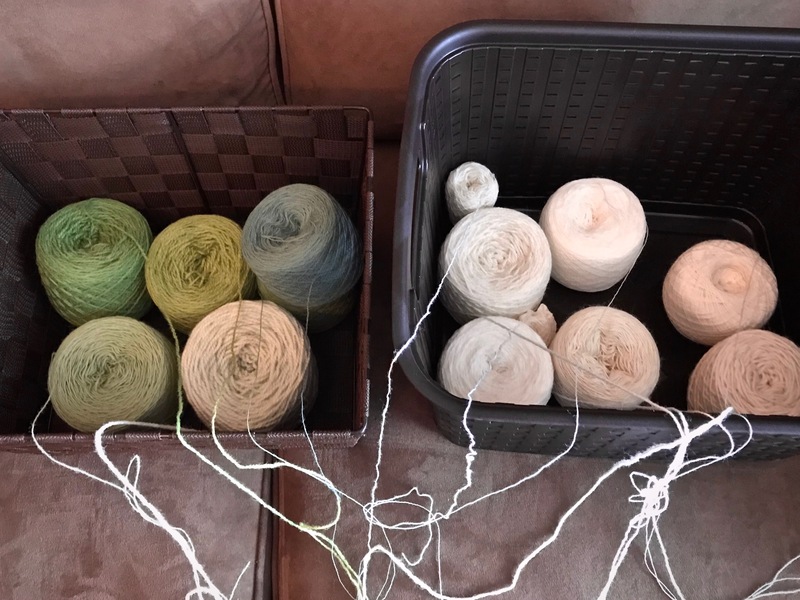 Various wool yarns, light green and white. I combine strands to make a bundle that is approximately equivalent in size to four strands of 6/2 Tuna wool. Green and white wool butterflies are each a little bit different. Butterflies hang in order on a length of seine twine within easy reach of weaving. Color blending and color gradation is possible through the careful selection of prepared butterflies for each section. Me. It’s all about me. That’s exactly what the tempter wants me to think. Everything should revolve around me. Wait a minute. There’s a tapestry being woven that is much bigger than me. I may be a single wool butterfly. I’m unique. And my colors and textures contribute to the tapestry in important ways. But I mustn’t forget the Grand Weaver. 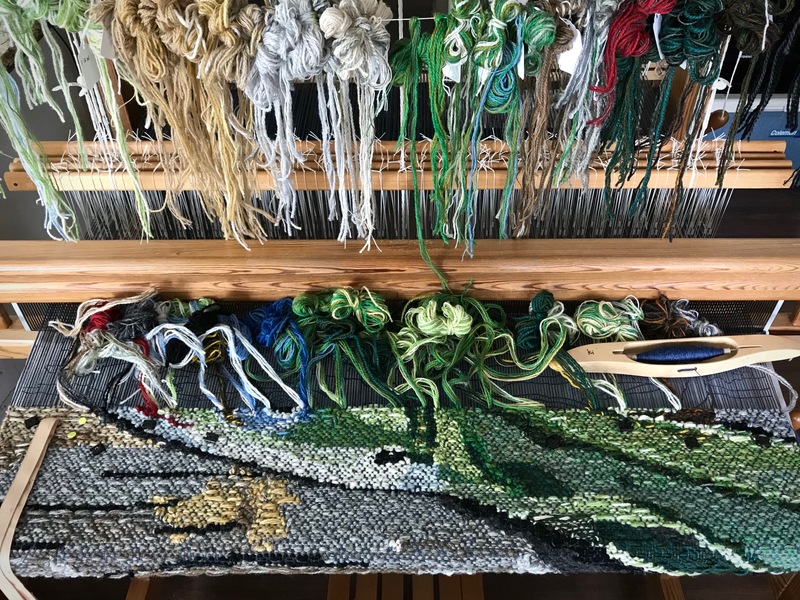 He carefully and deliberately wound these strands of yarn over his loving fingers to create the color he wanted to see in his tapestry. It’s not about me. It’s about the One who holds me in his hands. May your unique colors contribute to the tapestry. Karen, so glad your back! Can’t wait to see your sweet lizard coming to life! Hi Liberty, It won’t be fast, but I think we will be able to see consistent progress on the lizard. Holy cow, Karen! When you take on a project, you really go for complicated! I admire your courage and stamina as well as your creativity. Hi Annie, I do enjoy a challenge! I am practically outdoors in the middle of trees when I’m weaving. It’s refreshing to weave between corner windows. That’s how it is with the little loom at our Texas hill country home. I have windows beside my other looms, too. But this is different. Here, I have windows beside me and in front of me. Corner windows for weaving pleasure. 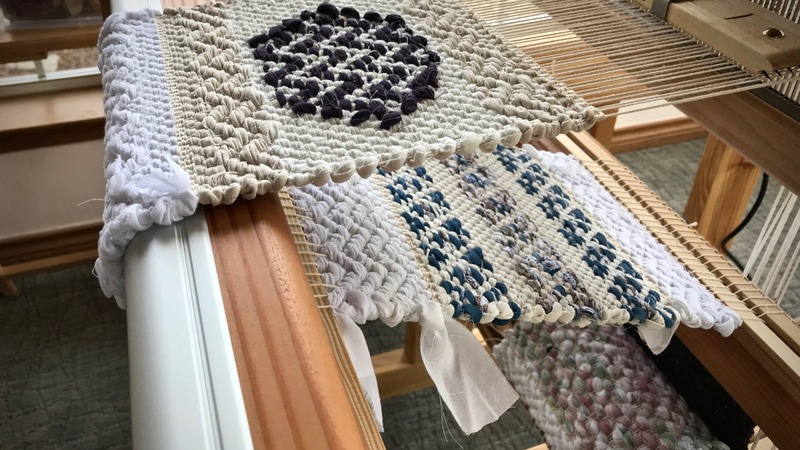 Color-and-weave plain weave placemats on the little loom. Nature is resplendent with ornamentation and flourishes that influence my weaving. Colors, patterns, shading, and playful surprises. They work their way into my thinking and planning. Aren’t the Creator’s designs amazing?! 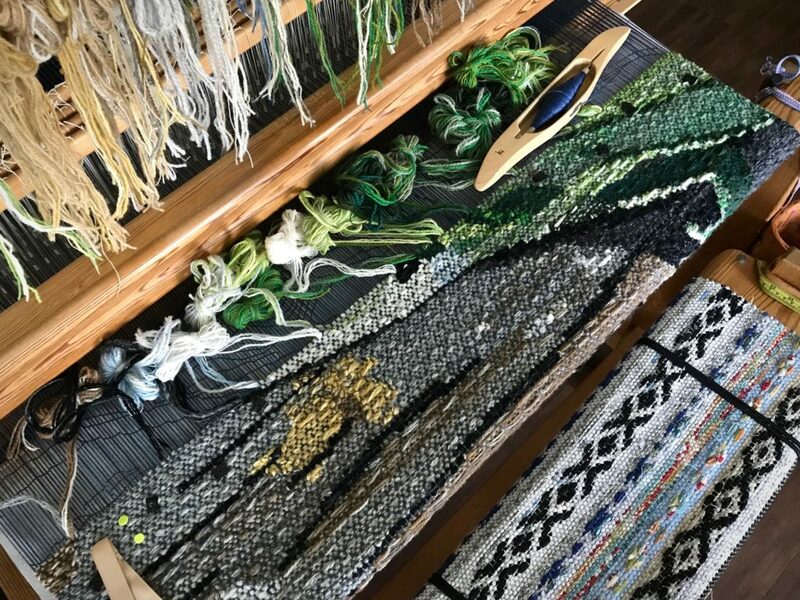 So, to be surrounded by all that inspiration while weaving raises the enjoyment at the loom all the more. Color – variation, pattern – color and weave, shading – two-pick stripes, playful surprise – offset warp stripes. It is refreshing to experience the enjoyment of nature. We need that. Our minds need refreshing, too. Our minds can be freshened up. When we grow in the knowledge of God—who he is, what he is like, and what he wants—our minds are refreshed and renewed. It’s a breath of fresh air for our thinking. Like weaving out in the middle of the trees. Hi Joyce, I’m thankful the Lord gives us daily reminders of His nearness! Such beautiful inspiration! You are indeed fortunate. Hi Beth, Yes, very fortunate! 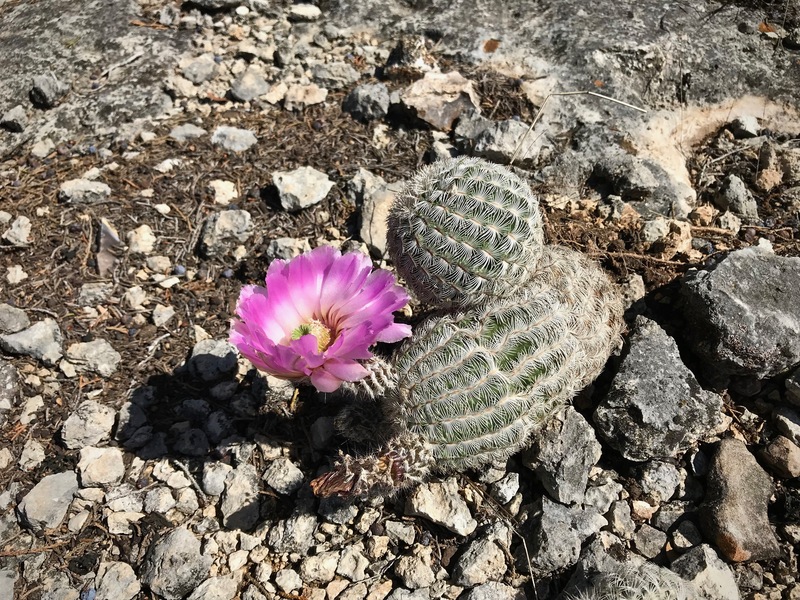 I enjoyed seeing the photos of nature through your eyes. It gave me a fresh perspective. As do your thoughts on our Heavenly Father. I always enjoy your posts and learn from them. Do you move your loom from place to place, Karen? Hi Annie, This little loom stays in that spot by the corner windows. Steve built the loom for me specifically for our Texas hill country home, so I could have a loom to weave on when we go there. 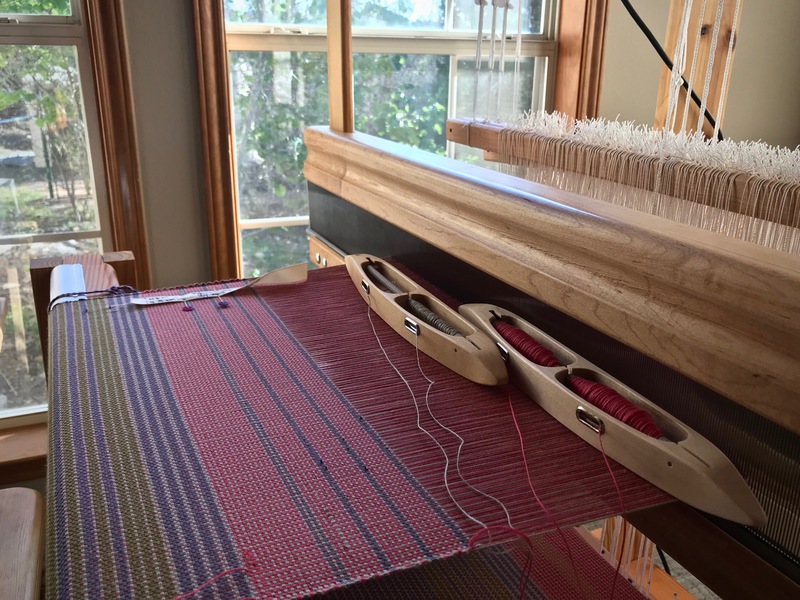 I have two other larger looms that stay in place in our Houston home. 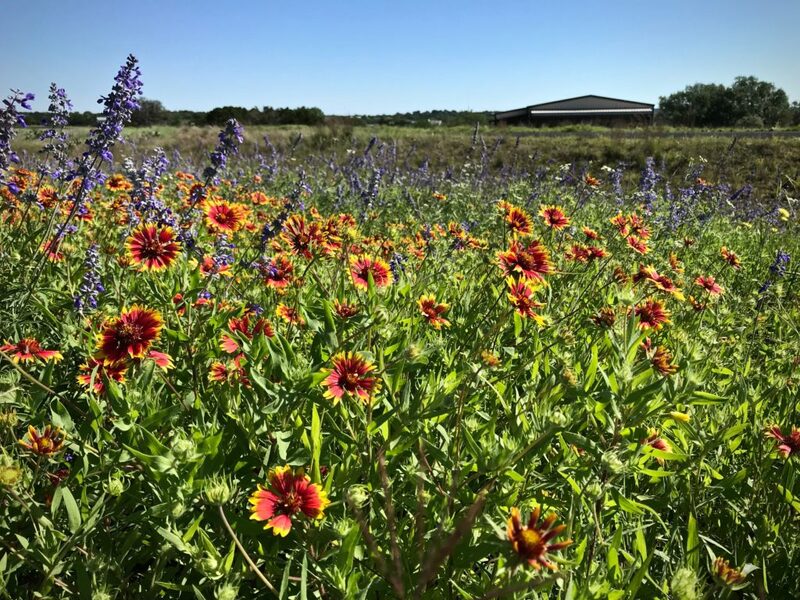 Thank you for including photos of Texas Hill country. It is beautiful and inspirational. The triad of purple / orange / green blessed by God. Thank you and may God continue to bless. Hi Nannette, The purple / orange / green triad in nature always seems stunning to me! 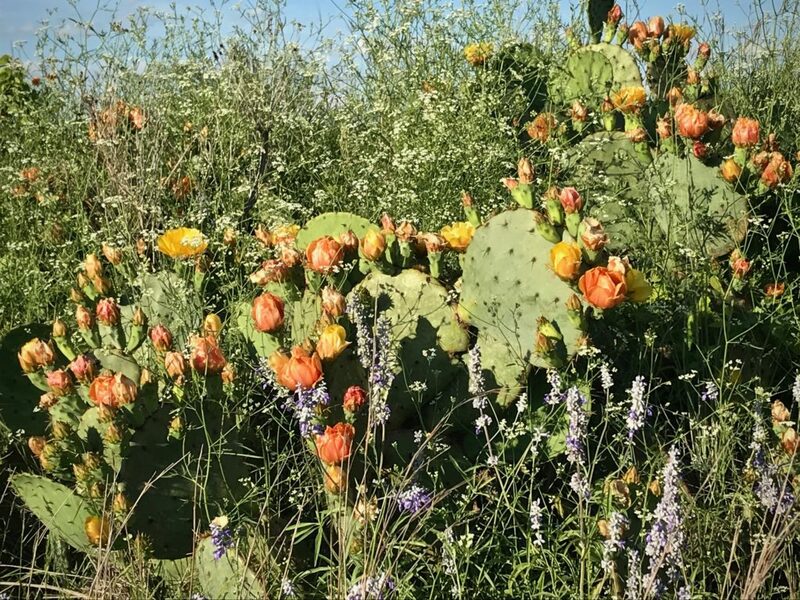 Texas hill country has many visual delights! The countermarch loom is known for having a clean shed, so that is my goal. Is that possible for ten shafts and ten treadles? The first treadle I step on reveals that treadle cord adjustments are definitely needed! Before making any adjustments, a few of the sheds look impassable, like this one. 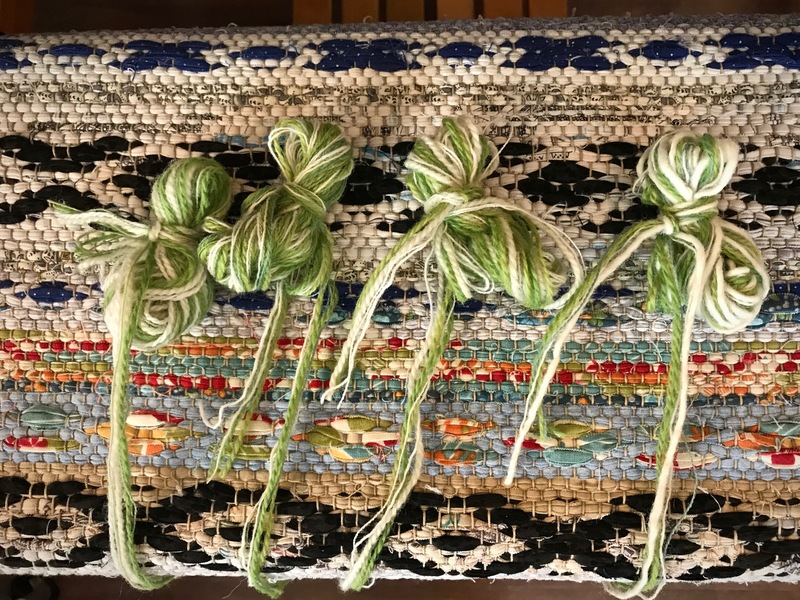 I learned the basics of making adjustments to treadle cords from Learning to Warp Your Loom, by Joanne Hall, and The Big Book of Weaving, by Laila Lundell. I also gained valuable experience from Vävstuga Basics, with Becky Ashenden. 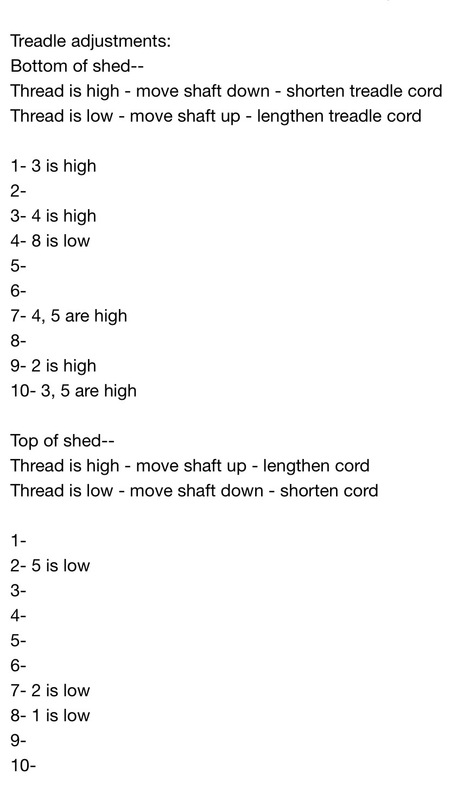 Here’s how the process looks for me, with this ten-shaft, ten-treadle project as an example. I keep the following note on my iPhone. It helps me remember how things work. I fill in the blanks for each treadle, noting which shafts are too high or too low. Then, using my iPhone note for reference, I make the needed adjustments. The first time through, I am primarily interested in the bottom of the shed. I make adjustments to clear the shed enough to be able to weave a little bit. Weave an inch or two. It is surprising how the shed cleans up with a little bit of weaving. Bottom of the shed has threads on one or two shafts that need to be lowered. After making those adjustments, this treadle will have a clean shed for weaving. After weaving that first inch or so, I go through a second, and a third time, if needed, to get a clean shed on each treadle. Adjustments for the top of the shed are only needed if there are threads that will interfere with the shuttle. No hindrance for the shuttle here. This is the kind of shed I hope to see on every treadle. When I first see a messy shed, I think, “How will I ever get my shuttle through that?” But it turns out to be little adjustments here and there. 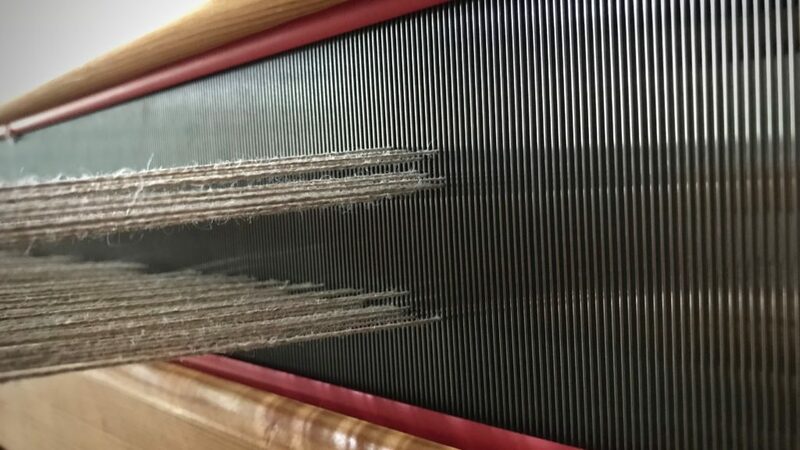 It’s not too difficult if you understand the loom. After all treadle adjustments have been made, the shuttle glides freely through the shed. And pick by pick, linen threads become cloth. Nothing is too difficult for the one who made heaven and earth. Our Creator knows how to help us. He hears our prayers for help, and little by little, we see what He is doing as the shed clears and the shuttle glides through, unhindered. May little adjustments clear the way for you. Thank you! I’m bookmarking this. 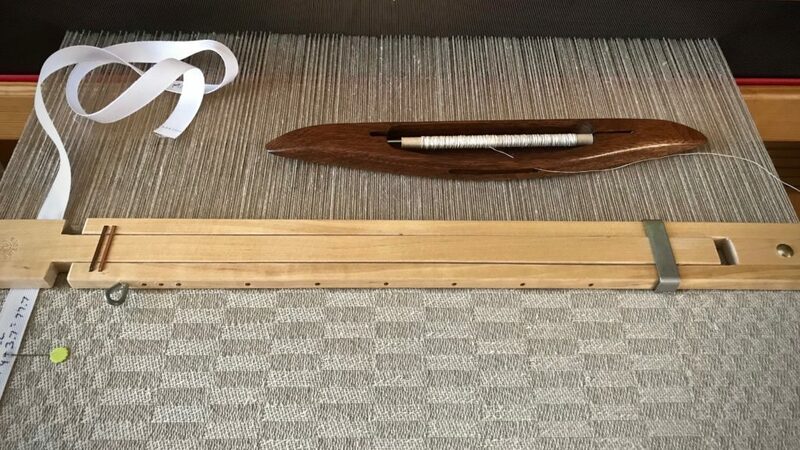 I was recently gifted an old Toika countermarch and I’ve only worked with jack-style looms. This will be invaluable to me as I begin learning! Hi Cathy, I am excited for you! I hope you enjoy your new countermarch loom as I do mine. Let me know if you have any questions along the way as you get going. Thanks Karen! If you don’t mind, I think I will copy your notes to keep handy in my studio. I am hoping the same type adjustments will work with my ten shaft counterbalance loom. 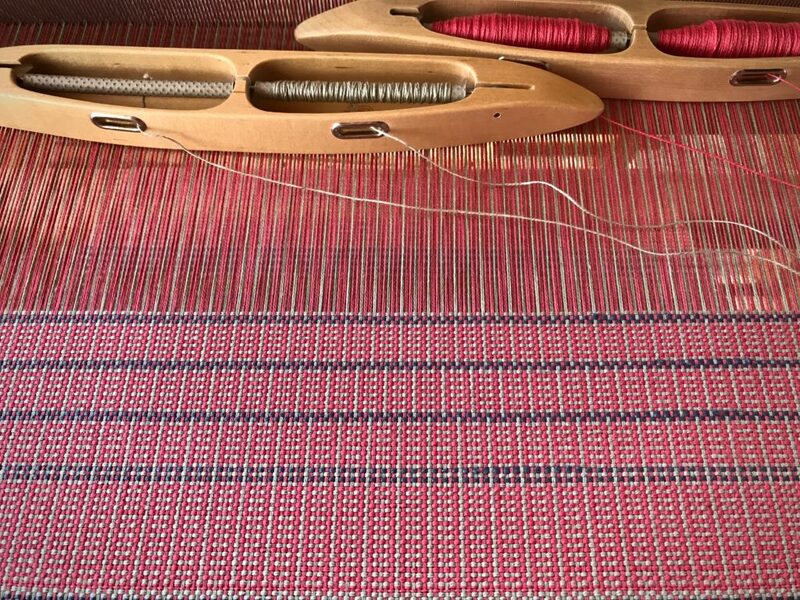 Getting under my loom is the hardest part for me. It’s like playing in a jungle gym! Hopefully your notes will simplify the tie-up process. I have a six shaft weave to tie up today and will try your procedure. Hi Jenny, The process should work for you with your counterbalance loom. You’ll just have fewer tie-ups. It’s always exciting to start a new project! Here are the notes. You should be able to copy and paste from here. Let me know if this doesn’t work for you. I agree with Cathy M — for a beginner like me, this post will help me get those wonderful sheds the countermarch is known for. My first warp looked like the picture you showed, and I was overwhelmed. Thanks also for including the references: I have both books and will look at them again. Hi Marjorie, I’m so happy you are persevering through the learning stages! It’s all downhill from here. 🙂 I know that overwhelming feeling. Those two books have been steady references and friends for me to help solve all sorts of problems. 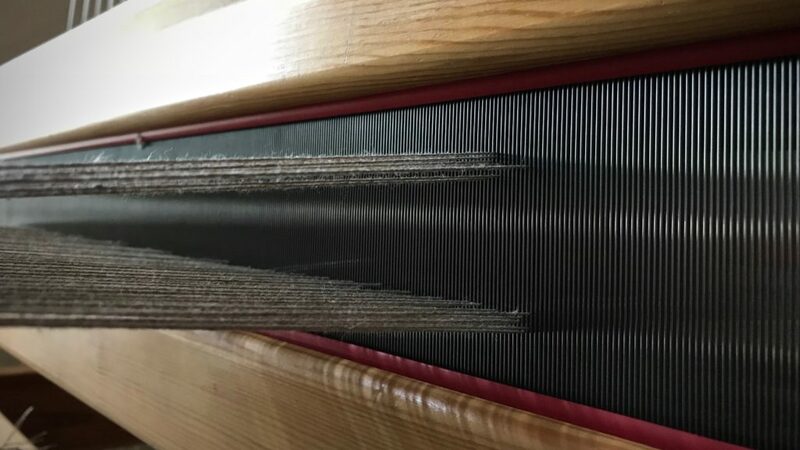 I’d love to hear about your clean sheds the next time you put on a new warp! Karen, I hate to bother you, but I tried saving your form, but is is like a photo, so I can’t edit it would you mind e-mailing a copy to me? Thanks! Hi Jenny, See my response to your previous comment. As I was reading this post, I thought that living life is very much like adjusting the shed/treadles. When things aren’t going well, sometimes we just need to patiently figure out which area is where the problem actually lies and then start with small adjustments in that area only to solve the problem. I often need to be reminded of this as I tend to want to scrap the entire project! Have a blessed weekend, Karen. And I am also keeping the notes you created for my future loom. Thank you for sharing! Annie, Yes, that’s a great reminder to me, too. Those small adjustments can make a world of difference! I appreciate hearing your thoughts. Thank you for your clearly written help. I was given a beautiful Glimåkra Countermarch loom a couple of years ago and I’m learning something new every time I weave another project.I have noticed a horrible shed where pressing one treadle – on my current 4 shaft project. I didn’t know where to begin with making adjustments -from the top or at the treadles. I shall follow your advice and try to make some small adjustments with the treadle cords. It doesn’t hurt to start from the top. A while back, after adding some shafts, I had a terrible time getting a good shed. I was pulling my hair out until I finally looked closely at every cord, starting at the top. I found two cords from the jacks that were crossed and connected to the wrong shafts. That solved everything! 🙂 Also, sometimes a poor shed is actually an indicator of crossed warp ends somewhere. What I have learned is that there is always a solution! But often, it takes a little bit of detective work. I’d love to hear how your shed dilemma works out! 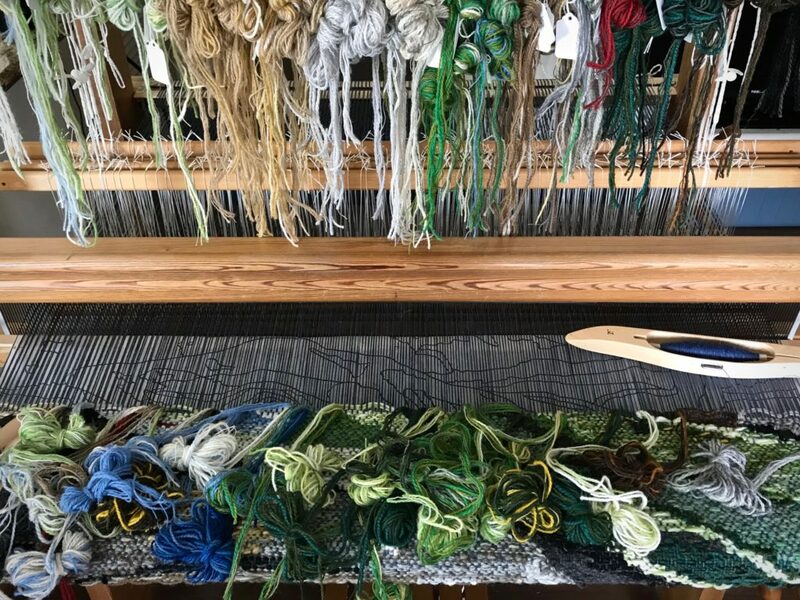 Karen, your post comes at the most opportune time for me as I’ve just spend the better part of today pretending to be a pretzel under the new loom trying to make sense of a million cords and lamms only to find a shed looking very much like your top picture as my results . I have read and reread the books you mentioned and was just going to begin the process of finding where I needed to make adjustments when I read your process here and it all clicked! I’ve added your process to my phone as well and will attempt to work through each step as you noted in the morning. Thank you again!! Hi Charlynn, It does take some time to learn how it all works. It gets easier the more you do it. I’m glad this post came at a good time for you! Hopefully, you are very close to smooth sailing.